Mario Kart 8 was one of the finest games on the Wii U. It, along with Super Smash Bros., offered a brief glimpse of hope for the future of the failing console back in 2014. With Mario Kart 8 Deluxe coming to the Switch this Friday, we thought it would be fun to put out a list of the best Mario Kart 8 tracks. Just about every track in the game is a winner, and you could make an argument for pretty much all of them. 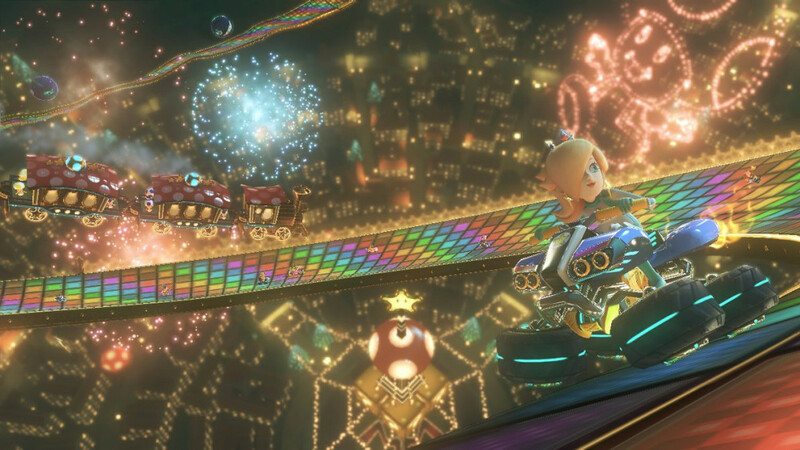 At the end of the day, there can only be five Best Mario Kart 8 Tracks, and we’ve got the “definitive” list. At the number five spot, I have to go with Rainbow Road 64. Although the race is definitely a bit short, it’s one of the most beautiful courses Nintendo has ever made. The visuals are stunning, and the race really feels like a celebration of the Mario Kart series in general. The iconic fireworks are back from the N64 days, and the music is as peppy as ever. I love the golden embroidery surrounding the course, and the toad-captained trains throwing you coins. Plus, races on this course are always intense! With the relatively shorter race time, things are always tight. Flying over the finish line with that beautiful golden “1st” on your screen will make your heart flutter! 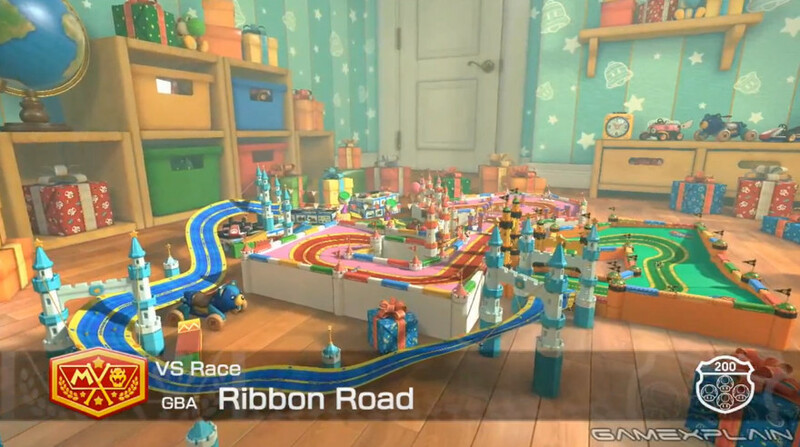 I’ve always loved Baby Mario stages, and Ribbon Road is no exception. 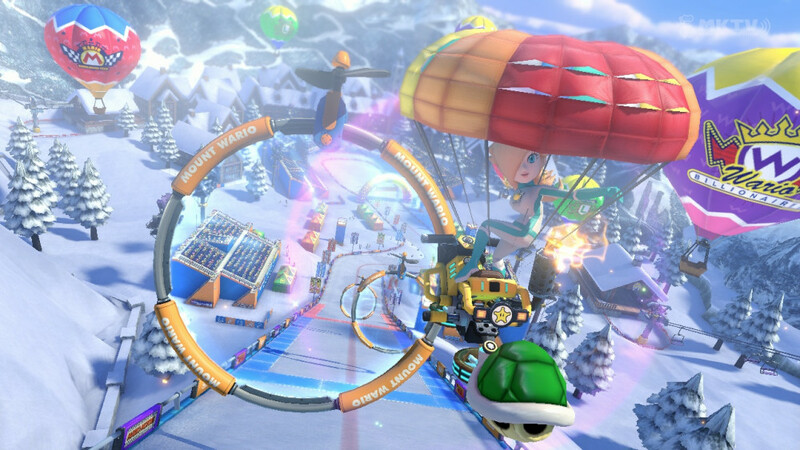 While not specifically a Baby Mario-oriented stage, it captures the playfulness and fun of Baby Park, but also offers a compelling race track. Different segments offer dramatically different challenges. You have to be able to dodge mechakoopas, nail tight turns, and safely navigate rickety bridges to succeed. And on top of all that, there are some very high-risk, high-reward short cuts to attempt. Every lap, you have to measure the risk and reward before trying to hop off a swaying bridge and onto a thin block ramp leading to a flying ramp. On 200 CC, this becomes even more challenging, forcing you to consider your position in the race (and overall standings) before taking the jump. This is an intense race course, and it’s one of the best in Mario Kart history. Electrodome is another classic course. The Star Cup of Mario Kart 8 will go down as the best cup in the history of Mario Kart, and this a huge reason why. The idea of racing through a Koopa Club, complete with dancing Shy Guys and Goombas and a heavy bass, is absolutely crazy, and that’s what makes it perfect! Strobe-lights dance across the glittering road as piranha plants bounce to the beat. Disco balls pulse in the background… the whole thing is so alive that it’s easy to get lost in the surroundings. But if you’re not careful, you’re like to eat a green shell and be passed by a storm of competitors bouncing off one another in the awesome zero-gravity area. 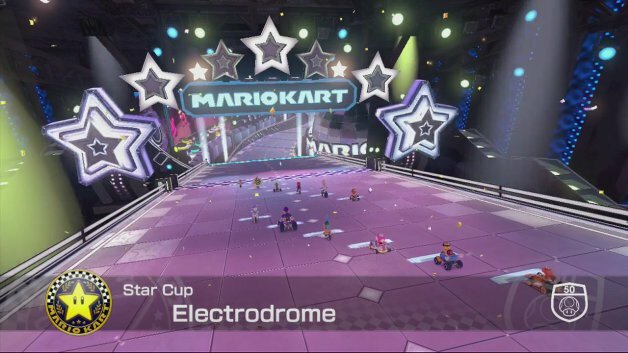 The Electrodome embraces the craziness of Mario Kart, and that’s what makes it special. While zany humor and belly-laugh inducing moments are a critical part of making Mario Kart what it is, at the end of the day, Mario Kart is a racing game. To me, Mario Kart 8 gets racing right; better than any other Mario Kart 8 before. There are two courses that highlight this reality, and the F-Zero inspired Big Blue is one of them. This track feels FAST. Like… really, really fast! You’re constantly boosting, being propelled forward by rushing water, and bouncing off of zero-gravity boosters. The turns are tight and difficult to make, capturing the challenge of old F-Zero games. And then, of course, there’s the soundtrack. Mario Kart 8 has an amazing soundtrack, but I think that the Big Blue remix is the best in the game. Mount Wario is the best Mario Kart race ever. Hands down. It’s not even close. The race opens with 12 racers packed into a helicopter hanging above a snowy mountain. The gate opens as the “3…2…1…” countdown flashes, and once the Lakitu tells you to go the race begins with a jump down to the snow below. The race that follows tests your skills on so many levels. The beginning has you showcasing your drifting ability, before adding in low-grip ice terrain. Then you enter a cave with rushing water, and your paragliding skills are tested. From there it’s time to zig-zag through the trees, and then down a ski slalom. Finally, there’s a huge drop off, filled with boosts, that leads to a high jump glider section. Finally, you reach the bottom of the hill and land in the stands with tons of cheering fans. This is the most epic race you’ll find in any racing game. 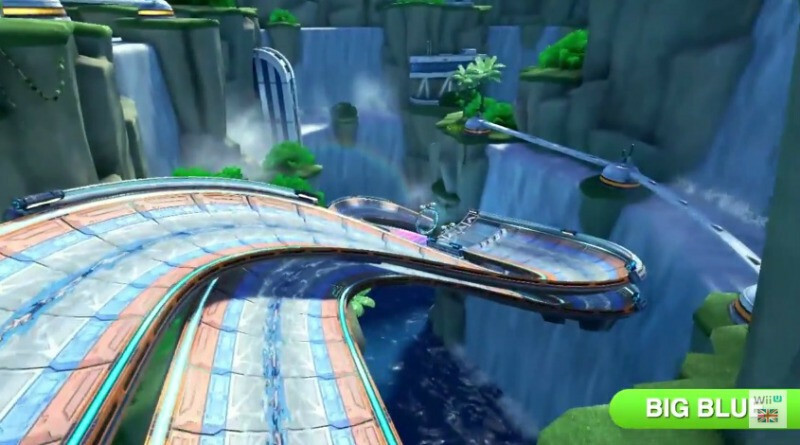 I’m still wondering, three years later, how Nintendo plans on topping this course when Mario Kart 9 eventually drops. Until then, I’m beyond excited to revisit Mount Wario, and the rest of the best tracks in Mario Kart 8 when Mario Kart 8 Deluxe drops for Switch! Did I leave your favorite track off this list? To see where I’d rank it, check out this old blog I wrote several years ago ranking ALL of the Mario Kart 8 tracks!